We featured Kian Goh at the Unspoken Borders Conference this year, during the Talk20 session. Having Goh be part of the conference was fantastic, particularly because of her direct engagement with the queer community on design issues. One of her projects is featured in our hot-off-the-press publication. She was also recently interviewed by the American Institute of Architects – be sure to listen to the mp3 of the interview. She articulates the importance of promoting social justice through design. Though she specifically speaks to an architectural audience, her words resonate well with other design fields. For MLK Weekend, my partner and I took a road trip down to South Carolina to volunteer for Senator Barack Obama’s presidential campaign. It’s been a minute since I’ve thought about electoral politics and even the prospect of electoral organizing. To say the least, I had become a bit disillusioned with the process. But we had some prospects of doing some interesting work since one of our college friends is the deputy field director in South Carolina. The 8-hour drive seemed worth it to me and I’ve never been excited about a presidential candidate before. For a long time, I didn’t put my hat in for any candidate. Then a friend handed me Obama’s book “Dreams from my Father” to read and I was instantly hooked. I realized I knew little of Obama at that point, and was pleasantly surprised to read that he worked as a community organizer in south Chicago. I’m going to try my best to do some live blogging while I’m here at the Obama Headquarters in Columbia, SC. Keep checking for more updates. Here are some scenes I took from this year’s NYC Pride. It was a beautiful thing to see so many family taking over the streets! Yesterday, the Judson Memorial Church located in Manhattan hosted a conference called “How the Church Failed Us: A Way Back from Spiritual Violence“. Attendance was sparse, but I believe this was a result of poor outreach rather than disinterest and relevance of the issue. The conference brought people of Christian faith together to discuss how religion was being used to alienate and oppress people of color and queer folks. I found the panelists and speakers engaging, flowing well from topic to topic. The most enjoyable speaker for me was keynote Ron Buford, former director of the “God Is Still Speaking” campaign. I didn’t know about this campaign before, and how socially transformative and progressive (i.e. controversial) it was, transforming churches into spaces of affirmation rather than condemnation. Ron’s words about the need to address our nation’s lack of spiritual development reminded me of Grace Lee Boggs’ writings. My partner and I were also invited to speak on a panel and share our personal experiences with spiritual violence. Though I wish it weren’t such a tall order, my partner and I are trying to find a spiritual home(s) affirming our interfaith, inter-racial, queer relationship. As a buddhist, I was tentative to be a panelist at first, but was assured that my experience growing up in a white, conservative Southern town was an important one to share. It’s taken me many years to develop an understanding about the way my childhood friends made me feel guilty about not being Christian. Their hurtful words were wrapped up in what they were hearing and internalizing from their own churches, perhaps not necessarily from God. The way they questioned my spirituality were denials of my own family, culture and spiritual journey. At best, they regarded my being buddhist a novelty, and not a legitimate practice. So when I became an activist, it was too easy for me to equate Christianity with being oppressive and fundamentally conservative. I think that something is taking place in my own spiritual development, where moments of opportunity, affirmation, and reconciliation are taking place. To have had the opportunity to share my story at this conference, in a Christian church, was such a moment. And as an activist, I found it very hopeful to that these kinds of challenging conversations are taking place within the church. I appreciated reading this article about the 1 million+ scholarships available for white ethnic groups, providing clear perspective of how much money exists to support white privilege. I am not necessarily advocating that these scholarships be eliminated because they do serve a purpose for some communities, and certainly there are many white folks living in poverty that could use this kind of monetary support (side note: I wonder how many people from those communities actually receive anything like this). However, there should be nothing wrong with scholarships made available for people of color, women, differently-abled, queer folks, single mothers, etc. 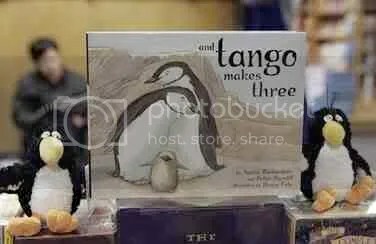 [There are] concerns involving “And Tango Makes Three,” the illustrated children’s book based on a true story of two male penguins in New York City’s Central Park Zoo that adopted a fertilized egg and raised the chick as their own. Complaining about the book’s homosexual undertones, some parents of Shiloh Elementary School students believe the book — available to be checked out of the school’s library in this 11,000-resident town 20 miles east of St. Louis — tackles topics their children aren’t ready to handle. I want to applaud Superintendent Jennifer Filyaw of Illinois for not giving in to the reactionary, homophobic fears some parents have voiced about the children’s book entitled “And Tango Makes Three”. Filyaw is not removing the book from the shelves, nor is she moving them to the adult section. Interestingly enough, the article also shares that adoptions often occur in the penguin world, and I’ve read similar things with other animal species. I hadn’t heard of “And Tango Makes Three” prior to the news article and am eager to find a copy of it somewhere and read it myself. Has anyone seen a copy in Michigan? Good news — I came across a copy of the book at a nearby Borders, located in the non-fiction children’s section. The story is adorable, and the best part is that it’s based off of actual circumstances at the New York City Zoo. I can see why Illinois parents were concerned and made many assumptions. Still the story is not explicitly “homosexual”, though it was affirming for me to read as a queer person. If you know any young children, the book makes a great holiday gift! I’ve been meaning to write about how excited I am to be part of the Radical Women of Color Bloggers‘ blogging community! It’s one of the main reasons I decided to actually start a blog. Prior to learning about them, blogging seemed like another individualistic, elitist, white, hetero-normative thing to do. Little did I realize how blogging can be used as tool to uncover and fight racism and oppression, as well as provide a platform for self-transformation. Yeah, it’s that cool. To draw from some readings I’ve been doing on Margaret Wheatley, this online community is more than just creating a critical mass of radical voices in the blogosphere. I think that the revolutionary aspect of this is the critical connections we are creating with each other, and the Radical WoC Bloggers is giving us a medium to strengthen and broaden these connections. What a hot clip! (Flash required). This is a British commercial. With such an “edgy” approach, I doubt that it got much, if any, play in the United States. An investigation of the systems, infrastructure, and design processes that create or perpetuate socio-economic and environmental stratification of communities, this publication explore issues of the environment (constructed, cultivated or untended), public health, mobility and access, communication, and race, class and culture. Featuring authors from design fields of architecture, landscape architecture, city planning, historic preservation, and urban design.